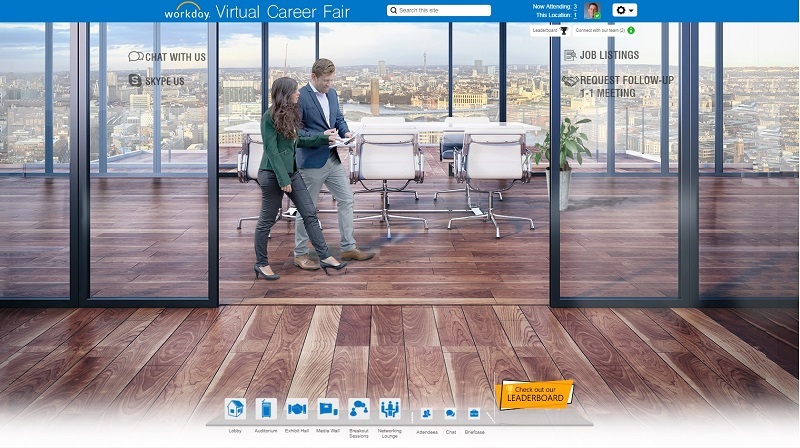 Communique Conferencing’s award winning virtual career fair platform functions like a traditional off-line career fair translating exhibit halls, booths, chat, presentations and recruiter interaction into a fully customizable 3D virtual environment. Candidates can join from any computer or mobile device. After logging in attendees enter the fully customizable lobby where a video greeting will welcome applicants. On screen hotspots provide entry to the Theater, Exhibit Hall, Resource Center and Communications Lounge. Consistent navigation at the bottom of the screen provides additional functionality and shortcuts. 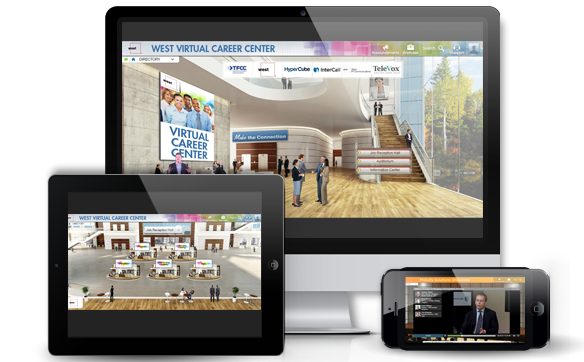 Choose from dozens of design templates or upload any image to create a completely custom Welcome Lobby, Exhibit Hall, Booth, Theater, Resource Center or Networking Lounge. Create a completely custom virtual conference in minutes. Click on the Hershey’s image to the left to view a sample gallery. The Exhibit Hall gives attendees the ability to browse exhibitor job fair booths, engage in a discussion with a recruiter, view and apply for jobs. An exhibitor directory makes it easy to locate specific booths all with a click of their mouse. Exhibitors can choose from pre-designed booth templates or completely custom design. Booth administrators can add their company logo, and upload job listing, documents, white papers, videos surveys, and prize giveaways. When a visitor enters a booth, reps receive an alert. Attendees can chat live with a booth rep or optionally by Webcam. Direct candidates to the virtual breakout room to conduct live video interviews. The Lounge or Communications Center offers professional networking features including scheduled discussions, message boards, forums, message center to send/receive messages and group chat. 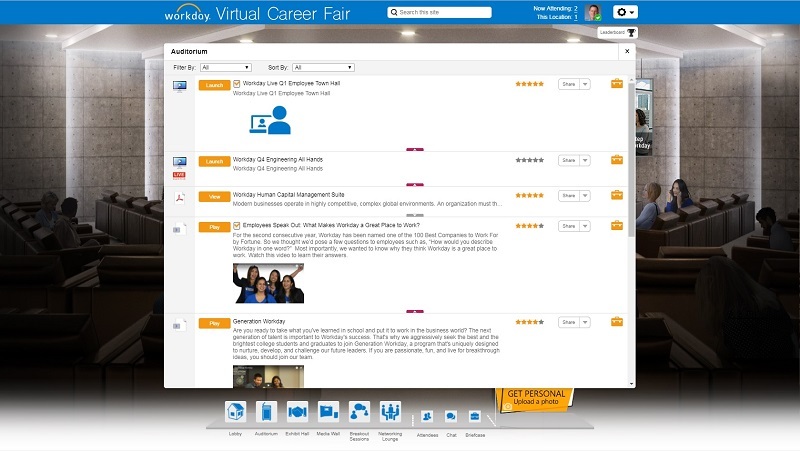 A central repository of all recruiting fair content including; benefits, corporate videos, documentation and presentations with search and bookmark tools. Attendees can visit the virtual Auditorium to attend live and on demand webinar presentations. Attendees can save presentations in their Briefcase and participate in live Q&A. Tools are also available to search and bookmark content. Webcast Studio enables you to easily deliver Live, Semi-Live and On-Demand presentations (audio, slides and/or video) to any audience on any device. Features include; chat, Q&A, surveys, polls, and social media integration. Alternatively, you can link to any 3rd party webinar service such as GotoMeeting, WebEx, Adobe Connect, YouTube, Vimeo, etc. Highly Reliable & Secure: The most robust, secure, globally deployed and reliable hosting infrastructure available. 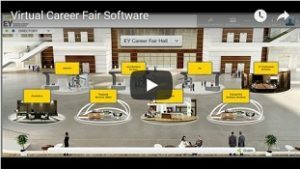 Article: What is a Virtual Career Fair? online request form to the right. © Copyright 2019 Communiqué Conferencing, Inc. · All rights reserved · Various trademarks held by their respective owners. When you give us personal information, we will use it in the ways for which you’ve given us permission, or ways in which our clients who provided us the personal information instruct. Generally, we use your personal information to respond to an inquiry or to help us provide and improve our products and services for you and our clients with which you have a business relationship. We may also use the personal information you provide to contact you regarding additional or new services and features offered by Communique, or important information regarding Communique. Your information will not be sold, traded or used for unsolicited marketing.